Crumble Lane School is as dull as dust until ... TARA-TARA-TARA! BOOM-BA-BOOM! 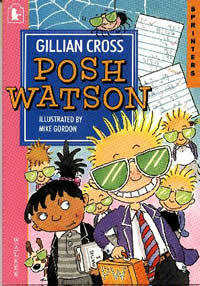 Posh Watson arrives - and suddenly everything is brilli-doodle-ant! If you want to find out the truly whizzaceous things that happen - you'll have to read the story for yourself! Everything on this site is copyright Gillian Cross unless otherwise stated. Feel free to use information in any school work, but do not copy for commercial gain.